Tip: Beat the summer heat by loading up on foods that cool you naturally from within. After months of waiting for the arrival of summer, don’t let the heat drive you indoors! 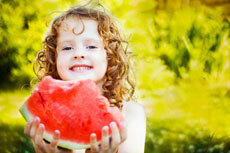 Eating naturally cooling foods helps you stay comfortable on even the hottest days. Fruits and vegetables high in water content, cooling spices, smaller portions, lighter preparation methods and smart hydration all will help you stay cool as a cucumber through the dog days of summer. You say nothing cools you like a cold beer on a hot summer day? Not so! Alcohol is a diuretic, which increases your water loss and puts you on the road to dehydration. Keep cool and hydrate with flavored water, coconut water, fruit chillers, smoothies, chilled soups or nature’s best hydrator – plain water. A cold drink before you exercise in the heat will help you stay cooler throughout your workout. Surprisingly, even a hot cup of tea can help cool you down – drinking hot beverages stimulates receptors in your stomach that promote sweating, your body’s most efficient cooling mechanism. Don’t let the heat zap summer’s fun for you. For a festive and cooling summer dish, try Chef Marshall’s Red, White and Blue Salad. Brimming with water-rich fruits and veggies and cooling mint, it is perfect for your July 4th barbeque or on any hot summer day. Choose foods that cool you from within so you can spend your summer enjoying the beautiful weather, not running from the heat.